Cycling is a great way to tour Napa Valley's vineyards and woodlands, and it also facilitates a closer read of the many political signs that have sprouted along its highways and backroads, most of which are either for, or against, Measure C, the Watershed and Oak Woodland Protection Initiative that Napa voters will decide on June 5. 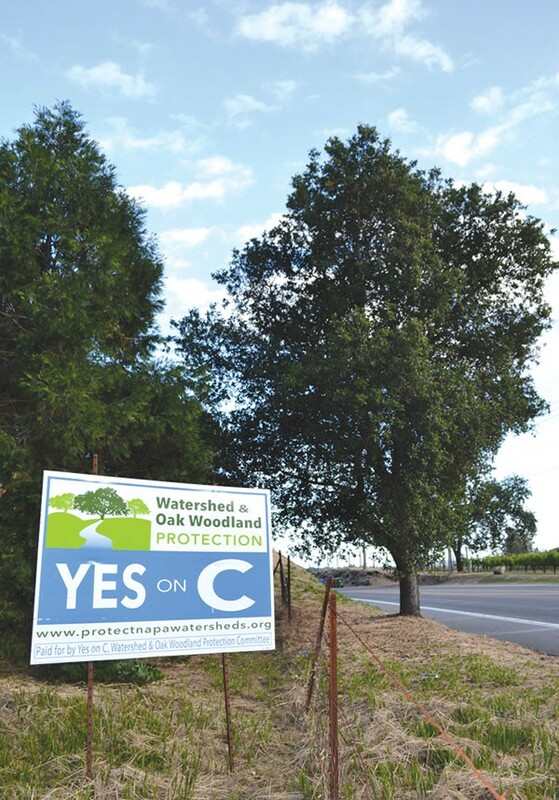 While riding in the CampoVelo Gran Fondo this April, I was treated to a variety of competing claims along the way: the few "Yes on C" signs candidly say what proponents claim the measure will accomplish. "No on C" presents a more piquing suite of succinct warnings: C will hurt farmers, increase traffic, threaten hillsides, and also is bad. I was content to stay out of the fray until, rounding a corner on a remote slope south of Angwin, I saw a rarer anti-C sign that said something like, "Doesn't Save Trees." Say what you will about the potential negative downstream effects of not cutting down trees in a watershed—stay with me, now—but can't we just agree that C is about saving some trees? Yes, campaigns are arguments, but this one increasingly reminds me of the "argument sketch" from Monty Python: "Look, this isn't an argument," says Michael Palin. "Yes it is," counters John Cleese. "No it isn't," Palin replies, "it's just a contradiction, the automatic gainsaying of whatever the other person says." It does not surprise Angwin resident Mike Hackett, co-author of the initiative. "We've entered this era, starting with the national election, of these alternate truths." Hackett says it's all about polling. After the Napa Valley Vintners turned against the measure they'd initially helped craft—in part because polling results showed they'd almost certainly lose such a fight, according to Hackett—they turned to polls showing that traffic, hillsides and water were among Napa residents' top concerns. "They took them and flipped them 180 degrees," Hackett says. "It doesn't matter that it isn't real or true; they just say it to confuse voters." One contrary voice not just gainsaying is that of Stuart Smith, co-founder of Smith-Madrone Vineyards. For Smith—who says, "My dog isn't in this hunt," since C would not apply to his property—it's a matter of principle. "What they're taking is the right to plant a vineyard," says Smith, who offers property-rights views on his website. Hopefully, Napa voters will make an informed decision after reading up on both sides, never mind the signs. As for me, as Palin says at the end of the sketch, "I've had enough of this." For: protectnapawatersheds.org. Against: protectnapa.com. Stu Smith: stopmeasurec.com.